A cyle goes around, clockwise counterclockwise. Started fresh, collecting pictures made more than a year ago. Caught by needing links to previous and coming details at wall-cnfs. 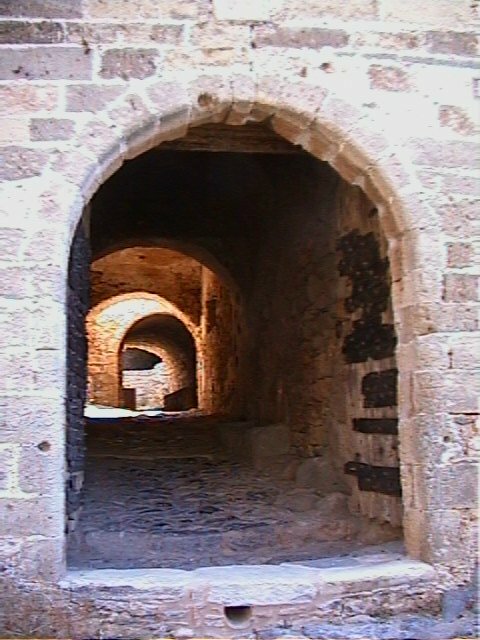 Although it is one topic there are two story lines, a split in the middle. Finished adding some new pictures explaining focus monitoring. 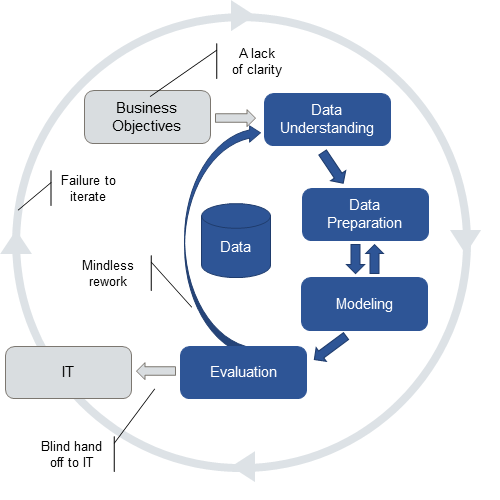 The devlopment proces of a "machine learning" proces has been invented separated from Business processes and separated from ICT. The used words are different. One of the oldest an best frameworks is crisp-dm. For information on data science a good site is "kdnuggets". The assocation is getting gold from "knowledge discovery in databases" process, or KDD. Searching for crisp-dm challenges and data science. The crisp-dm proces is felt problematic:  fail crisp-dm -1- or fail crisp-dm -2- . Missing or neglected or otherwise going bad are the connections to business and ICT. Microsoft has bought "Revoltion Analytics" and is going for an important at Analytics and BI. Although they are using the same step as Crisp_dm, it is not circular. It is business request without the PDCA cycle, there is start (charge) and end (delivery). The ICT deployment is mentioned, needed for a delivery, but not detailed. -//- It is a best practice to build telemetry and monitoring into the production model and the data pipeline that you deploy. This practice helps with subsequent system status reporting and troubleshooting. The hierachical top down communcation line is a pyramid. There are many departments doing a part of the job. 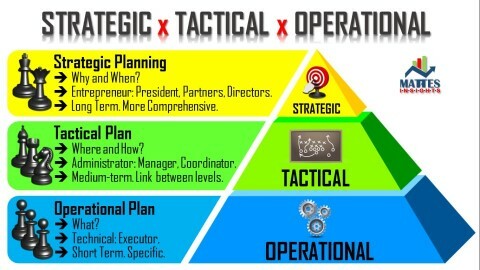 s The tactical level is also there for guidelines and compliancy with legal requirements. Placing the data, information, in the middle the legal requirements aside the data a circle for running processes can by made clockwise. The requests from business perspective at the right side going down to the operational area. The operation ICT delivering the service at the left side. 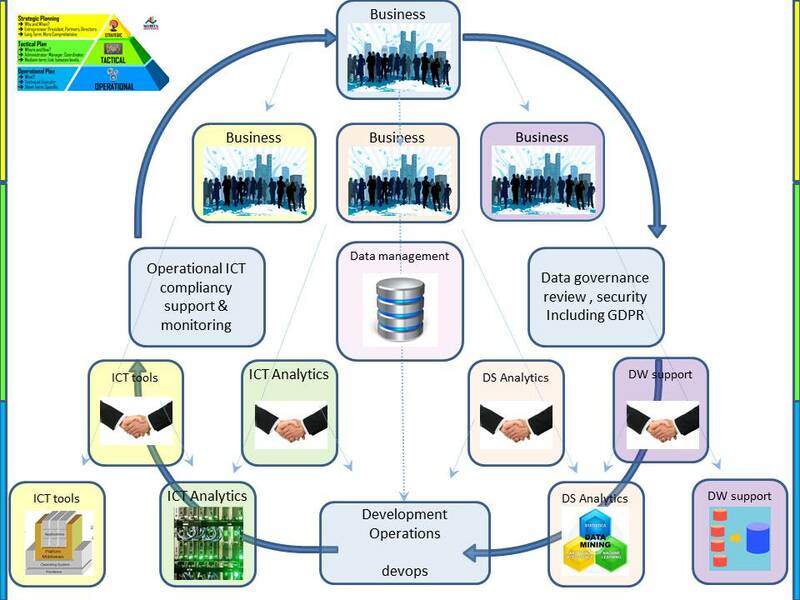 At the bottom there is curious connection where business requests having developed and ICT realization are coming together under supervison of business control. Getting the business software aligned according to their goals using the available Infra, changing those configurations helping at alignments. Programming, analyzing the data, proposals for better business decisions. Managing the data commonly using a DBMS with a roles of the DBA, DataBase Administrator. Using NoSQL, more simple or more complicated: Hadoop, Cloud. There can be much more than these mentioned depatments. 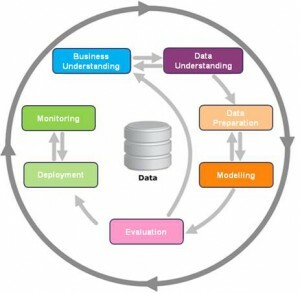 These four are the ones essential in an Analytics Proces Life Cycle. Some of those departments have a direct shared control, others only by going up the whole hierarchy up and than going back. 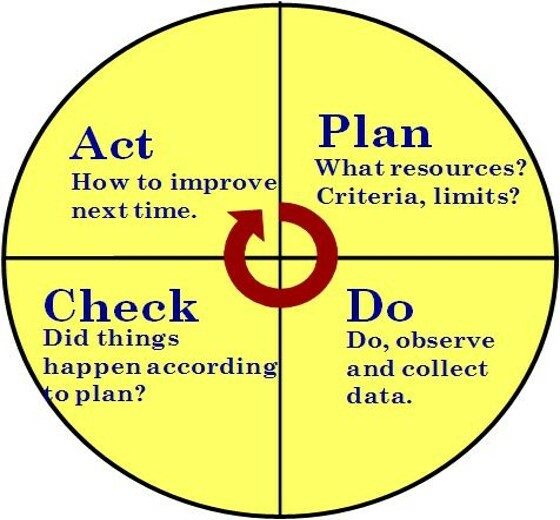 The PDCA cyclus is a standard approach. With DMAIC (Lean Six Sigma) there is an additional control step after an improvement to prevent falling back in old problems. I use small colored circles in the picture for every involved party doing their work. It covers planning, deadlines with changes. There are multiple PDCA cycles. One for the overall process and three others for every direct involved party. 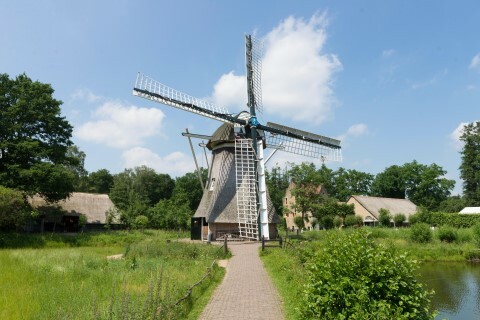 The picture is getting too crowded, cleaning up the departments that are necessary in the holostic cycle but NOT within the continously improvement of the business proces. Improvements doing the own work of the shown departments should also be included in the continously improvements. Tactical representation (blue) moved outwards, making room for inner circle . A full big PDCA colored circle having the "DO "at the bottom (operational) is added with three smaller ones. The diagonal green and orange lines are departmental involvments. Business with four representations in the vertical and horizontal crosshair lines (blue), The one in the bottom is lacking a clear definiton being a tempory role. =ICT Analtyics= ⚙ and =DS Analtyics=  are both having different tasks at each of their corners, depending on all the others being involved. When doing work without any ainteractions the focus for each is getting the agreed work getting done within deadlines. Presidon crisp-dm is showing this more advanced picture. It is having "monitoring" after deployment. Presidion, formerly SPSS Ireland, was set up in Dublin as a regional office of SPSS UK in 1994 to be the main partner office in Ireland. 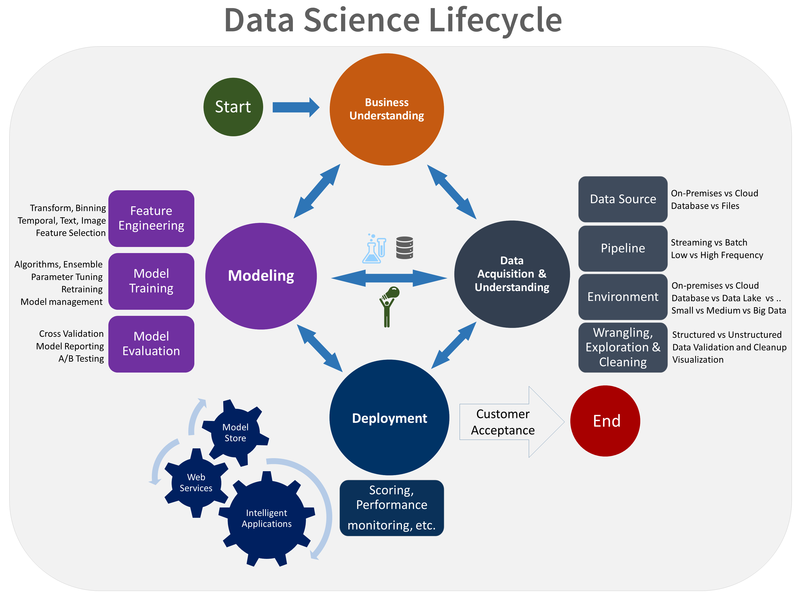 The deployment setup in a similar figure as ML modelling is not mentioned before.  Release management SDLC - release management. 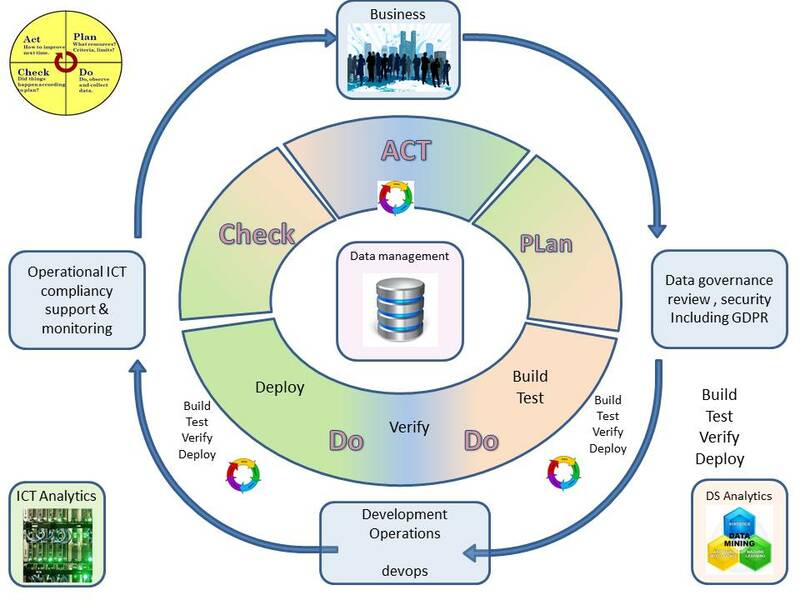 The picture is getting too crowded, cleaning up that big PDCA circle in the middle. It was temporary, a circle still being there. All crisp-dm stages  added at the ML devlopment ara (right side). The deployment ⚙ in a split up with model monitoring added (left side). Multiple data pipelines (dev - ops) because different set of policy requirements although they are logical / technical similar. DS  Determing * or 0 status. Ideas: improvements opportunities. BU  Business goals targets, budgets, mandate. IT ⚙ Information availability, options to add for new ideas. BU  ⚖ Verifying correctness policies legality data in proposals. 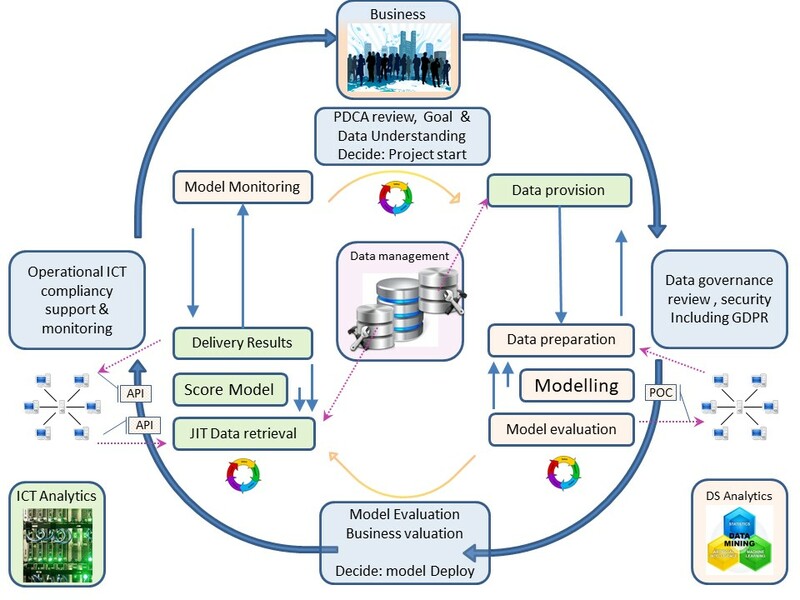 DS  Data preparation, modelling, model evaluation (DTA-). BU  ⚖ Verify expected model behavior, decide to deploy yes/no. IT ⚙ Retrieve delivered code, put them using DTAP in a release. IT ⚙ Running scoring, making monitoring results available (-TAP). BU  ⚖ Verify processing is according policies and legal (law). DS  Evaluate monitores scores and results on coorect behavior. Not mentioned is the underpinning on the algoithm (scoring) and its behavior. Impact for wrong results should have an alnternative reviewing proces that can give another outcome is to be considered. The decision of that alternative to be described, well documented.